Get How to Create Your #GivingTuesday Campaign now! Be sure you don’t miss out on the millions of Giving Tuesday donation dollars that can fuel your cause. See the impact of last year’s Giving Tuesday. Learn how to set up your Giving Tuesday campaign for success. Plan your post times before the big day. Check out 5 tools to supercharge your fundraising on, before, and beyond Giving Tuesday. Congratulations! You’re ready to make this your best Giving Tuesday yet. Giving Tuesday is a global holiday that celebrates generosity and kindness by giving to nonprofit organizations all around the world. In the same way that Black Friday and Cyber Monday kick off the holiday buying season, Giving Tuesday kicks off the giving season, highlighting the true meaning of what this time of year is all about. This philanthropic holiday sets itself apart as a social media celebration, hence the hashtag you often see associated with it (#GivingTuesday). Donors who give to charities on Giving Tuesday often share about their favorite causes on Facebook, Twitter, Pinterest, etc., and encourage their friends to give, too. Giving Tuesday falls on the Tuesday following American Thanksgiving each year. In 2017, it will be celebrated on November 28th. See why #GivingTuesday is a day to spread the word about doing good for others. people gave 1,560,000 donations to 40,000 nonprofits based in 98 countries. Giving Tuesday raised $168 million dollars in 24 hours. Want to see all the facts? Download the full E-Book. As Executive Director of The David Sheldrick Wildlife Trust, Melissa Sciacca leverages over a decade of experience in wildlife conservation to support, promote, and expand her organization. The David Sheldrick Wildlife Trust has been rescuing and rehabilitating elephants and rhinos in East Africa for 40 years. Their multi-faceted approach to conservation includes their Orphans Project, anti-poaching and surveillance efforts, and community education and outreach. As a result of the collaborative efforts of both development professionals and conservation experts in both the United States and East Africa, at-risk and orphaned elephants and rhinos can successfully be returned to their wild lives and form their own herds or join herds of fellow graduate animals. This incredible undertaking is fueled by the generosity of their passionate supporters. And that critical enthusiasm wouldn’t be possible without Melissa’s commitment to perfecting the art of engaging her constituents year-round and on Giving Tuesday. In the years since its inception, Melissa and her team have achieved enormous Giving Tuesday fundraising success. Here are her top tips to help you get more gifts on the nonprofit community’s biggest day of the year. 1. Create original content that compels people to give. 2. Make your Giving Tuesday ask goal-oriented. “Be specific about what you’re asking them for so they can see a direct impact.” she advises. “Nonprofits fall into a trap of generating a general ask on Giving Tuesday when they should be promoting a specific campaign.” Think compelling, creative, fun. A memorable campaign is a successful one. 3. Offer an added benefit to participating on Giving Tuesday. 4. Set yourself apart from the rest of the participating nonprofits. 5. Learn from your Giving Tuesday experience. The day after Giving Tuesday is a day to celebrate your successes, pinpoint opportunities to grow, and set goals for the following year. Melissa and her team pull Giving Tuesday reports in DonorPerfect to set a benchmark for what they can accomplish the following year. They also analyze their Giving Tuesday campaigns in Constant Contact and on social media to understand what people respond to and apply it to their future fundraising initiatives. Because of Giving Tuesday’s social media slant, the ability to accept donations online is a must. Your website, along with your emails and social posts, should all point to your online donation form. A standard website form should always be spotlighted by a bold donation button on your homepage. Once donations are received, you can manually enter gift and donor information into your records. Create buzz with a donation form that’s tailored to your campaign. Campaign-specific forms are perfect for emails and social media posts. If it doesn’t integrate with your fundraising software, be sure to block out time to manually enter gift and donor data into your system. A flexible form that syncs with fundraising software is the best bet for time-strapped fundraisers. 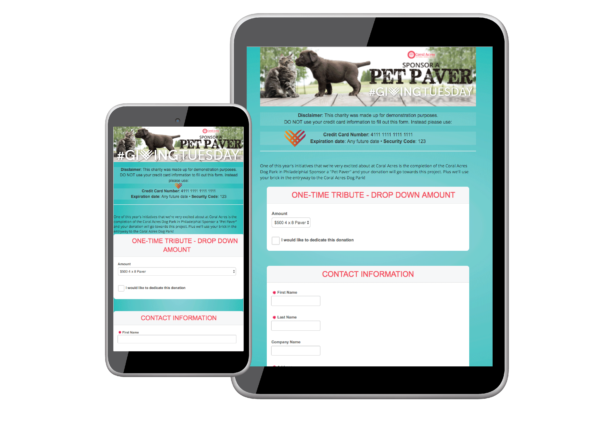 Customizable integrated donation forms take care of data entry and allow you to style the form to reflect your campaign theme. Some solutions offer unlimited forms. This allows you to create a form for every campaign, holiday, and social media ask you like! Don’t have a donation form yet? Don’t fret! Here’s how to create a customizable integrated online donation form that looks fantastic, eliminates double data entry, empowers donors to cover your processing fees, and gets you more matching gifts. Sound like a winner? We think so, too! TAKE 5 MINUTES TO SIGN UP FOR DONORPERFECT PAYMENT SERVICES. Collect online, monthly, mobile gifts and more with DonorPerfect Payment Services. It’s simple, secure, and seamless. Best of all, gift and donor information processed through DonorPerfect Payment Services is instantly reflected in your DonorPerfect system, so there’s no data entry on your part. STYLE YOUR GIVING TUESDAY DONATION FORM. Once you start setting up a Giving Tuesday form, make it yours. 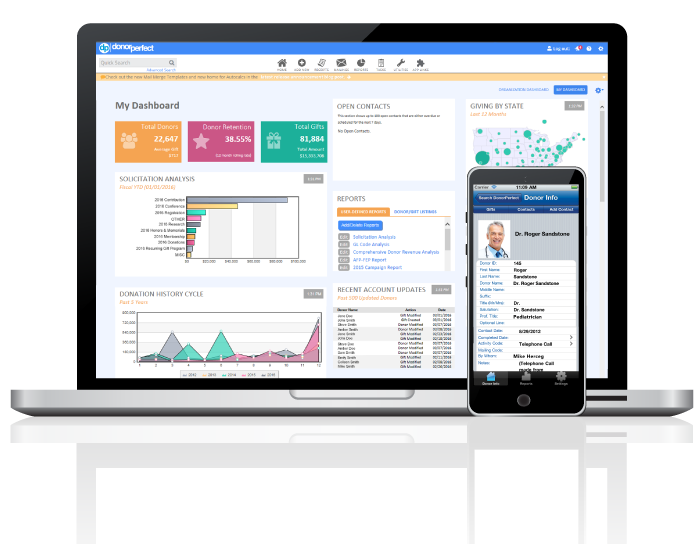 Gain donors’ trust by customizing it to reflect your organization’s logo, colors, and fields. It’s easy with our form styler – no design experience needed! TEST YOUR FORM WITH THE HELP OF YOUR STAFF. Your donation form is critical to your campaign’s success, so it’s important to have it tested before the big day. Send it to staff members and have them test it by making a donation. Get 100% of every gift? Consider opting for your form’s Donors Cover Costs feature that allows each donor to cover the small fee associated with processing a gift. That way, your Giving Tuesday processing fees could wind up being free! ALL SET WITH DONORPERFECT ONLINE FORMS? GREAT NEWS! You don’t have to stop at Giving Tuesday! With DonorPerfect, you can make an unlimited number of forms, including a generic donation form, monthly giving form, and campaign-specific forms as you hold fundraisers throughout the year. Check out some gorgeous examples here. Start creating your standard set of forms for every occasion! READY TO GET ONLINE GIFTS? Call 800-848-3279 and a DonorPerfect team member will help you get started. Watch this informative video to learn more about matching gifts! Double your gifts? Make sure to encourage your donors to submit match gift requests and make it easy for them to find out if their employer offers this fantastic benefit with DonorPerfect’s matching gifts integration. This feature alerts donors to their matching gifts options the moment they’re ready to donate – doubling their gift to you! Learn more. You can also ask a board member or sponsor to match gifts to your organization. This is a great way to increase enthusiasm, incentivize new or larger donations, or even kick-off your end-of-year campaign. Giving Tuesday is right on the heels of major retail holidays like Black Friday, Small Business Saturday, and Cyber Monday. How can your organization get gifts this Giving Tuesday? No matter how busy your organization is, you can send a professional looking email to your supporters in a matter of minutes. Email providers like Constant Contact make it easy with custom-made Giving Tuesday templates. Things move fast in the inbox. You only have a few quick seconds to get peoples’ attention. When writing your Giving Tuesday email, make sure to include a powerful headline like this right at the start of your message. 2. Tell a powerful story. 3. Make giving as easy as possible. With these tips, you have everything you need for your best Giving Tuesday yet! Start planning early and create a compelling email that gets you the gifts your organization needs. 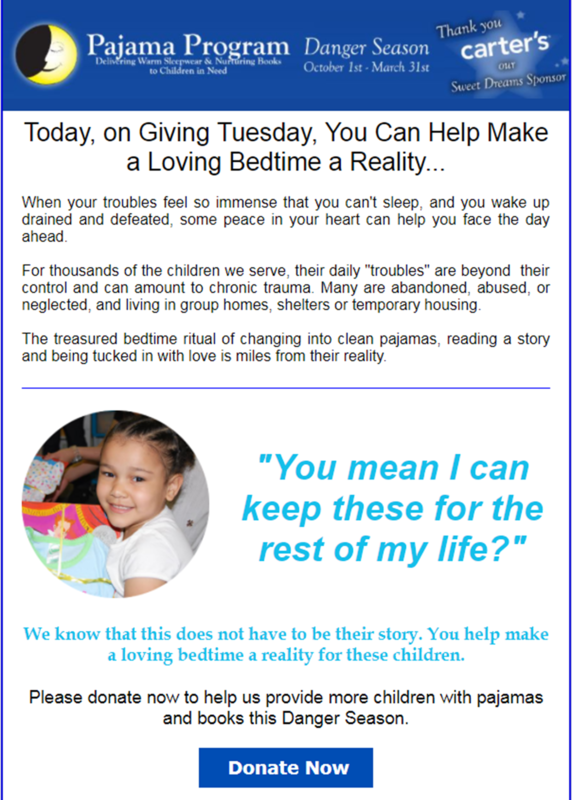 Start today using Constant Contact’s Giving Tuesday template! When it comes to Giving Tuesday, social media reigns supreme as the best channel to create instant buzz for the day-long fundraising campaign. 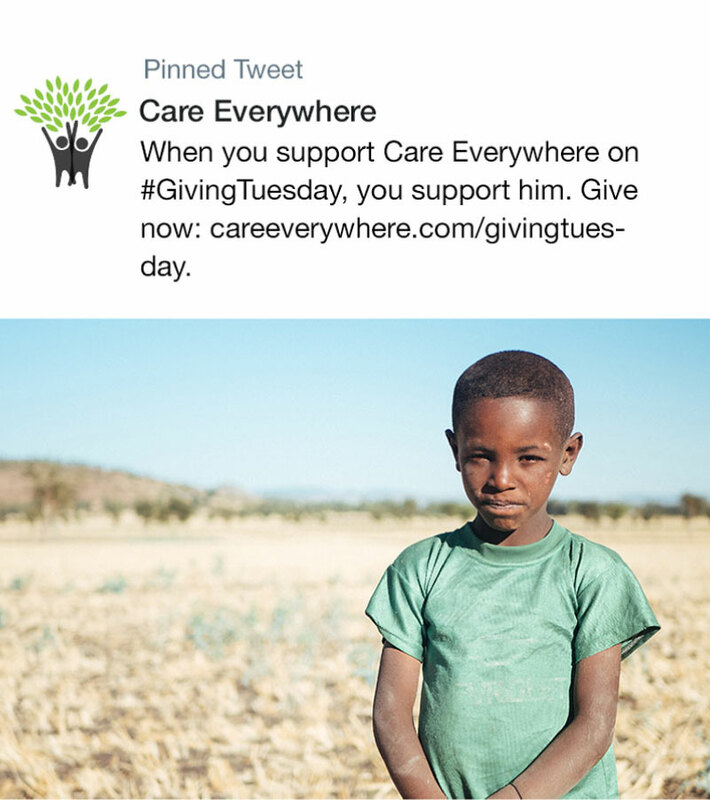 That makes Facebook, Twitter, and Instagram essential components of your Giving Tuesday outreach initiatives. It pays to prepare your social posts ahead of time, so all you need to do is copy and paste on the big day. Even better, a spreadsheet gives you the opportunity to record and analyze which posts are getting the most buzz leading up to Giving Tuesday so you can alter your day-of posts accordingly. Your Giving Tuesday campaign should say what you need to say in the amount of time it takes for a donor to scroll on past your post in their Twitter, Facebook, or Instagram feed. Prep before so you can practice saying a lot with less text. Because social media plays to short attention spans, it’s crucial to create your posts with the goal of catching eyes. Complement your ask with photos that show people the direct impact of their donations. Show them why they should give to you. A social media management tool like Hootsuite can take the stress out of timing your Giving Tuesday social posts by allowing you to schedule them ahead of time. A picture is worth a whole lot more than a thousand words on #GivingTuesday. Gorgeous photos that invoke warm and fuzzies, tears, or a call for justice will help your cause stand out in a sea of #GivingTuesday asks. To see all 5 Twitter-Friendly Social Post Templates, please download the full e-book. Once you’ve created your campaign, you need to organize your collateral into a single, cohesive plan that aligns your messaging across direct mail, email, text, mobile, and social media. Set up a spreadsheet with tabs for all of your communications and map out send dates and post times. Because Giving Tuesday is just one day, don’t play by the rules. Get the word out again and again to ensure your donors don’t miss the memo. Announce that your organization will be participating in Giving Tuesday 2 months prior to Giving Tuesday and again 30 days before. Once the 30 day countdown starts, post about it weekly. The day before Giving Tuesday, send out a reminder to make sure your supporters don’t forget. AT 6AM: Send an email to your donors announcing the official kickoff of your campaign and give them a link to your donation form. Change your homepage to feature your #GivingTuesday form and send out social media updates to your followers. AT 10AM: Send a second email. It should be a brief reminder about #GivingTuesday and its significance to your nonprofit. Be sure to post social media updates throughout the day to keep donors updated. AT 11PM: Send a final email appeal to get in any last minute donations. While this may seem like a lot of emails, our experience shows that during an event like this, there’s no such thing as too much communication. Your constituents will want to know how you’re doing. Plus, if they know you’re aiming for a specific dollar amount, they’ll be excited to follow along and celebrate with you when you reach your goal. Get social all day long on Giving Tuesday! FROM 7AM - 11PM: Post every 2-3 hours. Make compelling asks complemented by beautiful photos and tell donors how close you are to reaching your fundraising goal for the day and reinforce the ask. It’s Wednesday, November 29th, 2017. Giving Tuesday has come and gone. You’ve participated in a global day of giving, raised some impressive funds, and gained valuable learnings to apply to the next year. Now it’s time to make Giving Tuesday your launching pad for record-breaking year-end donations. Make sure they know that Giving Tuesday isn’t the only day they can get involved. Send a thoughtful We Missed You email to let your subscribers know how important year-end donations are to meeting your organization’s goals. Plan you follow-up in advance so you can deliver impactful messages that drive action through the end of the year and beyond! It’s never too early to get started. 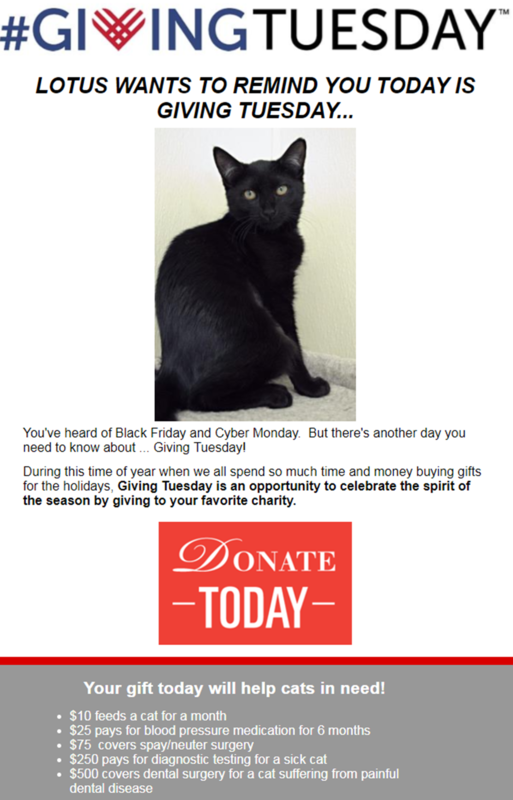 You can begin drafting your Giving Tuesday email today. DonorPerfect gives you all the tools you need to rally your current donor base on Giving Tuesday and turn new donors into lifelong supporters. From seamless online giving and peer-to-peer fundraising solutions to email marketing tools and custom reporting, DonorPerfect empowers you to work better together on a single platform, learn what makes your donors move, and most importantly, grow your means to make your mission a reality. And best of all, DonorPerfect integrates with all of the event solutions listed below! Save time, reduce costs, and raise more money for your mission on Giving Tuesday and beyond with integrated forms exclusively built for DonorPerfect and perfectly customizable to meet your organization’s unique needs. Forms include an optional Donors Cover Costs feature that allows each donor to cover the small fee associated with processing a gift. DonorPerfect Online Forms can be used for donations, event registration, memberships, volunteer signups, surveys, and more! Engage your supporters and track your communications’ success. Create styled and text emails using over 400 design templates - no need to be a technical expert! Receive instant reporting on opens, bounce-backs, and other critical measures and collect email addresses from website visitors. 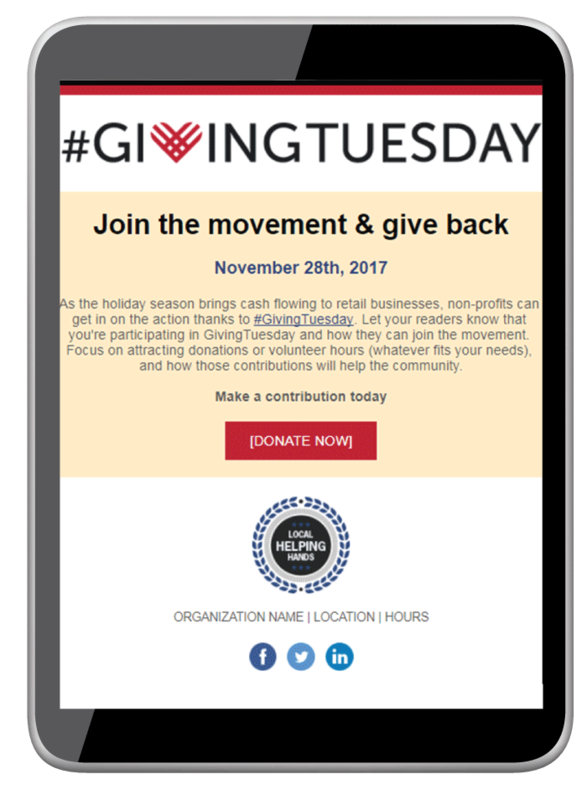 Empower donors to give in a flash on Giving Tuesday with DP Text, an integrated text-messaging tool that’s designed to effortlessly engage attendees and make fundraising easy. DP Text is accompanied by a live goal meter with a management panel that lets you add check and cash donations to your pledge meter with ease and keep donors posted on your progress. Get more matching gifts. With Double the Donation, you can let donors know they have a matching gift option the moment they give a gift and make it easy them to submit matching gifts by providing them with all the info they need, including simple step-by-step instructions. Download the full Giving Tuesday e-book here. GETTING SET FOR GIVING TUESDAY IS A SNAP. Set up your website and donation form. Create buzz with showstopping shareable posts. Establish new donor relationships that will fuel your cause all year round. BUT FIRST, GET THE WHOLE GUIDE! WE WISH YOU AND YOUR AMAZING ORGANIZATION A VERY HAPPY AND SUCCESSFUL GIVING TUESDAY.